Whether you’re looking to improve your home to resell or just want to update your current space, we’ve got you covered. A little DIY here and some elbow grease there can really breathe new life into a tired home. Use these creative hacks to wow your guests or prospective buyers, increase the comfort of your home for a little more peace, or better organise the space you have! Use an old frame as a memo board to track your grocery needs or to-dos. Use a piece of paper in place of a picture to provide a solid background and use dry erase markers on the glass. For a basic cabinet facelift, update your knobs and pulls. For a more drastic change (while still on a budget), consider adding a bit of flair to the recessed part of your cabinet by painting it with a contrasting colour, stencilling a pattern, wallpapering or even adding tile! If your countertop is structurally sound but awful to look at, there are a few ways to refinish it depending on the countertop material. If you are working with a laminate countertop, create a frugal faux stone You could also tile an existing countertop or build your own butcher block countertop. New kitchen appliances can be a big investment. If yours are dated but functional, update the look rather than the appliance. Stainless steel paint can add a new level of sophistication to the space at a fraction of the cost of a new appliance. Old backsplash can really date a kitchen. Think about these easy-to-use gel titles. With self-adhering backing, installation is very easy! Mirrors are not only useful, but when placed strategically, can make a room appear larger. Add basic full-length mirrors to the outer doors of your bedroom closet. Apply thin framing for a more finished look. Wooden bedroom sets are a classic and homey look for any bedroom, but the same old dresser and headboard can get boring to look at after awhile. Instead of replacing it, re-stain it! When trendy cherry stains fall out of style, take it darker with an espresso finish or lighten it up to brighten the room. Your bedroom should be a place of relaxation and restfulness, so if you have clutter, purge it! If you have to keep it, utilise under-the-bed storage containers (especially for seasonal clothing). You can also build a new bed frame from bookshelves to create more storage. If your budget doesn’t allow for a whole new comforter or duvet, add a couple of toss pillows to mimic the luxurious beds in hotel rooms and to give new perspective to your existing bedding. Your headboard is a perfect space for a focus piece in your bedroom. If you are just using a bedframe, consider adding one of these great DIY headboards to your bedroom. 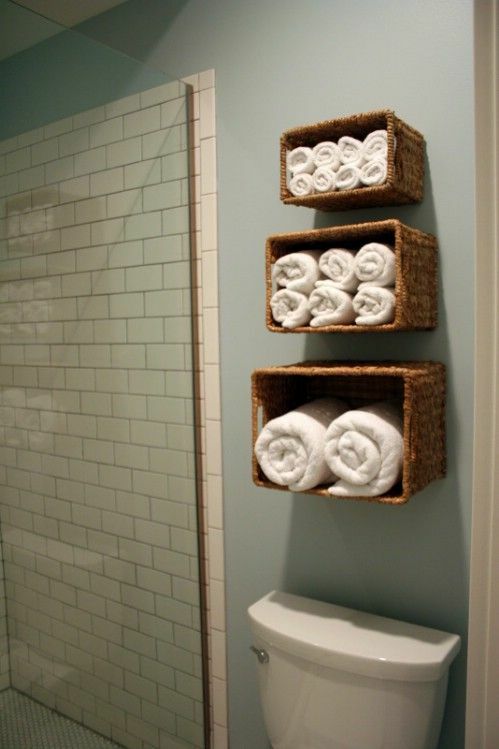 Install baskets onto the wall of your bathroom (open side out) for an innovative shelving option. Roll clean towels and stack according to size for a fresh and functional look. If the water pressure in your shower is low, it may be as easy as cleaning the showerhead to eliminate the issue. Fill a plastic baggie with white vinegar and secure the bag over the showerhead with a rubber band. Let it soak for one hour before you turn on the water to purge the holes. If you’re stuck with a mirror that is cemented to a wall, it can be a big hassle to remove it. Instead, improve its look by adding molding around the edges for a clean, finished look. If you are stuck with little to no counter space, install a small ledge between the sink and the mirror or around the perimeter of the room rather than investing in a whole new vanity and sink. For more storage, add hooks underneath the ledge for towels and robes. Cover unsightly panels (security, thermostat, etc.) with a canvas print. Screw hinges onto the wooden frame and install it onto the wall rather than just hanging it over for easy access. You can also use this same method to store and hide extra keys! Have a broken tile somewhere in your home? It could be a new opportunity for improvement! First, check to see the cracked or missing tile did not create a passageway for its surrounding tiles to crack or break any seals. If all is well, choose a few more sporadic tiles to break on purpose. Remove all the rubble and clean the now empty spaces. Replace the old tiles with a bright contrasting colour to add a little bit of interest to your kitchen, bathroom or other tiled space! Do you have a collection of heirlooms taking up space, but you’re not sure what to do with it? See it as an opportunity for décor! Hang old silver trays on the wall or use old typewriters as object art in a bookcase. Cover up unsightly linoleum floors with paint. Apply a basecoat to even out the old colour and paint it a solid colour or add a new pattern with tape. If you have low ceilings, use paint to create the illusion of taller walls. Paint the bottom 2/3 one colour and the top 1/3 a colour to match the ceiling. For a basic accent wall, choose a vibrant colour to compliment the room. If you want to make an even bolder statement, use planking to create a budget-friendly texture to the wall. Don’t forget about your fifth wall, otherwise known as the ceiling. Add a pop of excitement on your ceiling with texture or with a new light fixture. Pallets are a great gardening solution to small spaces and add a bit of style. You can stuff your pallets with colourful flowers, luscious succulents or tasty herbs. Add functional and simple seating with storage benches. Find tall crates to attach a lid for stool-style storage. Old toy chests also make excellent bases for DIY benches. Buy or make outdoor-friendly cushions to finish off the look. Add a small bar to your patio area with a collapsible shelf. Use hinges to affix a shelf to the side of your home or patio railing. Secure in place with brackets (also on hinges) so it can collapse when not in use. Add a simple fire pit where friends and family can gather for fun and food in the summer time. You can buy your own for a more mobile option, or build a simple concrete pit for cheap.